Join Winged Foot Title for the Family Fun in the Sun Weekend Bash! Join Winged Foot Title as we co-sponsor a two day event packed full of fun for the whole family! 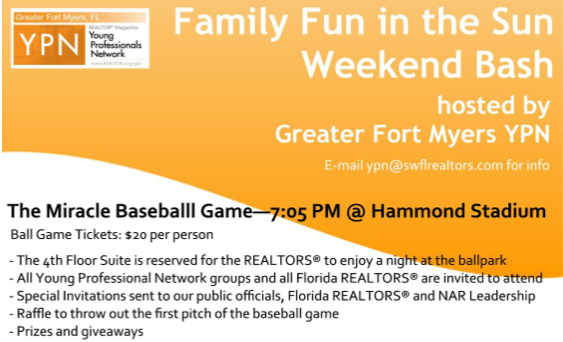 The Young Professional Network group and the REALTOR® Association of Greater Fort Myers & the Beach are hosting a night at the ball park tomorrow, August 24th, at Hammond Stadium. The Miracle baseball game will kick off at 7:05 PM, so come on out for raffles, prizes, giveaways & last, but not least, baseball!